I had neither enough yarn nor any desire to make long socks, so I just made these my preferred length in the leg, omitted the calf shaping (not that there would have been enough for me anyway), and kept the stitch pattern all around. No pattern. Basic top down sock, using 1×1 rib for the the cuff and 3×1 rib for the rest of the leg and the top of the foot. Other than making this shorter, I knit this pretty much as written. Took a while since it required more active attention than a lot of my other projects at the time (no matter how I tried I just could not memorize that chart) but I think it was worth it. I really love the result! Believe it or not, I hadn’t knit a plain old stockinette sock since 2005. But this yarn didn’t really want to be anything else; the colorway wasn’t playing nicely with any of the other stitch patterns I tried. It’s just as well, I really like how these turned out! They’re way better than those first plain socks I ever made, but that’s the power of experience for you. Another Cookie A pattern, which I found more intuitive than Mingus. I made a tiny error in one of the feet (thankfully not visible in this photo) that I didn’t notice until, oh, six months later? Oh well. No way I’m ripping it back and fixing it now. It was great to finally use this yarn for something – I’d bought it very early on in my knitting life and it was the only yarn I had in my stash thin enough to actually use on socks for myself with this many stitches around, so it was basically the perfect match. I didn’t love working with it (and couldn’t get more if I tried anyway), but it’s standing up well to wear. So those are all the socks I made for myself and hadn’t yet documented. There’s still a few more projects to share… but not today. Soon, though. 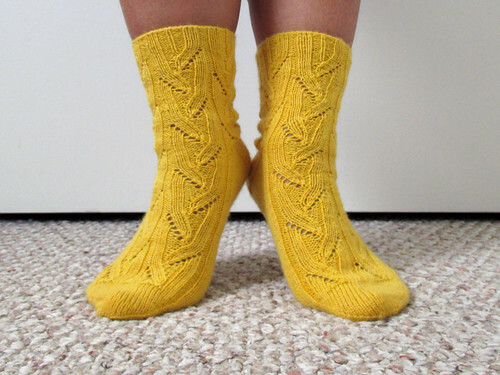 This entry was posted in Knitting and tagged Angee, Evening Socks for a Young Lady, Mingus, Plain Jane, Sunstone. Bookmark the permalink.